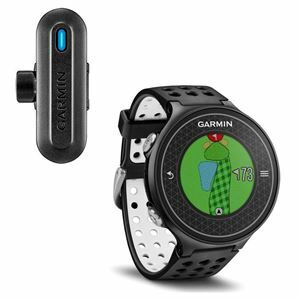 Garmin Approach S6 and TruSwing Bundle. S6 features full-colour course views for more than 30,000 international courses and a dedicated CourseView button to get you to the second shot view quickly. Preview doglegs, bunkers and water hazards and pin positioning from wherever you are on the course, or clubhouse. S6 delivers what a golfer wants - it automatically detects the golf course and handles hole to hole transition. On the course it shows at any time correct yardages to the front, back and middle of greens on a high-resolution, glove-friendly colour touchscreen. It offers distances to doglegs and layups, customised yardage points (mark bunkers and hazards). S6 has handicap scoring options for individual holes, player’s local handicap or index/slope method. Scoring options include Stroke play and Stableford, and you can save, review, share and print scorecards from your computer. Plus, when you hit a big one you can see how far it went with the Measure Shot feature. S6 even allows comprehensive stat tracking – keep track of fairways hit, greens in regulation and putts per round. Stay Discretely Connected Smart Notification lets you receive emails, texts and alerts right on your watch, even if you’re in the middle of the fairway. S6 acts as a wireless extension of your smartphone from your iPhone 4s or later, let’s you know you have a message, and displays the full text on its own screen whenever you’re ready to read it. SwingTempo and SwingStrength are new features on the S6 that help you when you’re practicing by providing swing timings and swing strength comparisons. SwingTempo is the timing ratio between the backswing and downswing and is useful for getting your swing in the right rhythm. If you’re having trouble hitting the right tempo then TempoTraining is available which allows you to select from ideal speeds and uses audible tones to help you achieve that speed. SwingStrength™ is a percentage of how hard you swung compared to your set full swing. This can be useful when practicing consistency in how hard you swing. It can also be used when trying to dial-in less than a full swing. S6 features more battery life for longer play. Easily get in a weekend of golf with up to 10 hours in full GPS mode up to 12 weeks on watch mode, before the lithium-ion battery needs to be recharged. Even heavy rain and harsh conditions are no problem for this 5 ATM(50 meters) water rated watch. 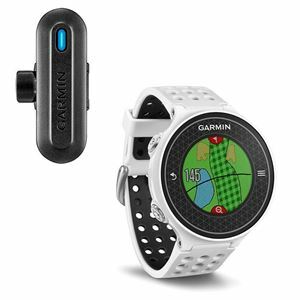 Garmin Connect is the online golf community that lets you play, then share and compare. Download your round, compare it to your last round and track improvements to your handicap for every course you play. Garmin Connect for Golf can even assemble your ideal round combining your best score for each hole to get your ideal 18 for that course. The S6 tells you the time, features an odometer to see how far you’ve walked and even has a round timer to keep track of how long it takes you to play 18 holes.